The event started at about 10:30am with opening prayer and the first stanza of the Nigeria anthem, it was suppose to be 10 am, but it rained cat and dog that morning. 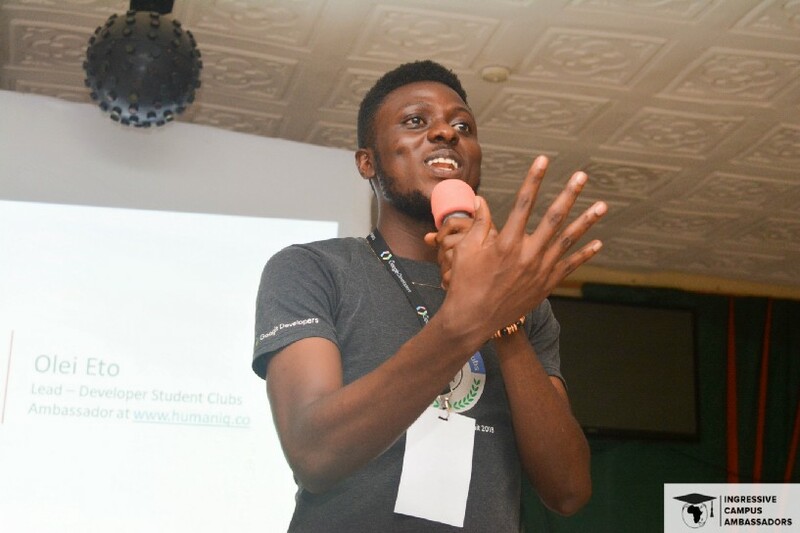 Thereafter I gave the opening speech and welcomed everybody to the maiden edition of the ingressive Tech meetup in Otuoke. I was suppose to be among the speakers of the event, just to discover that morning of the event that my presentation was nowhere to be found. I encouraged myself and decided to be the Mc. 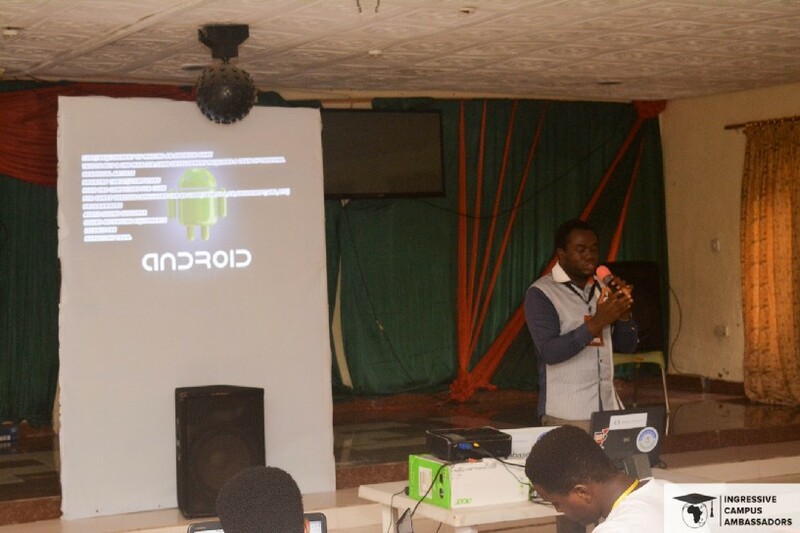 Our First Speaker was Ifeanyi, An android developer, CEO of Smart Olive games and a student of Mechanical Engineering. He spoke on “Android Best tools and Practices”. He did an excellent job explaining how he developed a game and in 3 weeks the game already had about 10,000 downloads on Playstore. Trust me, the people were astonished, so was i, he shared the secret and encouraged the audience to dive into the android world. 1st Speaker, Ifeanyi. Android Developer, and CEO of SmartOlive Games. Our second speaker was Benjamin Kurobara. An intern at Afridash, Ben, as popularly called, intrigued the audience with his awesome charisma and energetic delivery. He spoke on “Prototyping with Figma”. The audience were keen to his talk, he didn’t just give a theoretical aspect of his talk he gave the audience a demo, after which, i believe a lot of fellows saw reasons to begin diving into Figma as their design tool, he answered a lot of question in that regard and almost got an accolades from the audience. Benjamin Kurobara. Android and frontend developer. Next on the list of speakers was Isaac Chibuzor, Director of Igraphics. He Spoke on “The design Principles and Figma”. Isaac talked about design and its foundation and rounded off his talk admonishing the audience to take a look at figma, he told the audience how that he could do magic with the use of figma, Sounds funny, doesn’t it?. Once again the audience saw reasons to dive into figma. Thereafter, we took a break and watched a short video about Kelvin Doe a Sierra Leonean, his interest towards changing the narrative in his community. Shorly after the video, we had our Keynote Speaker, Prince Darlington, Creator of Codefii, Php framework, Prince challenged the mindset of the audience, he didn’t speak about designs or codes, instead he spoke about “Diving into Tech with zero experience” This got the audience interested, they perhaps had never heard it in that fashion, he challenged their mindset and encouraged them to get into the tech industry quickly and that the tech industry had no respect for gender, age. Among other things, what amazed the audience was when prince “Igwe da Vinci” said he understands and can write about 9 programming languages. Prince, Anointing the soul of the audience through his captivating talk. Our last Speaker, for the event was Samuel.B. Woniowei, Web developer and an intern at Afridash. 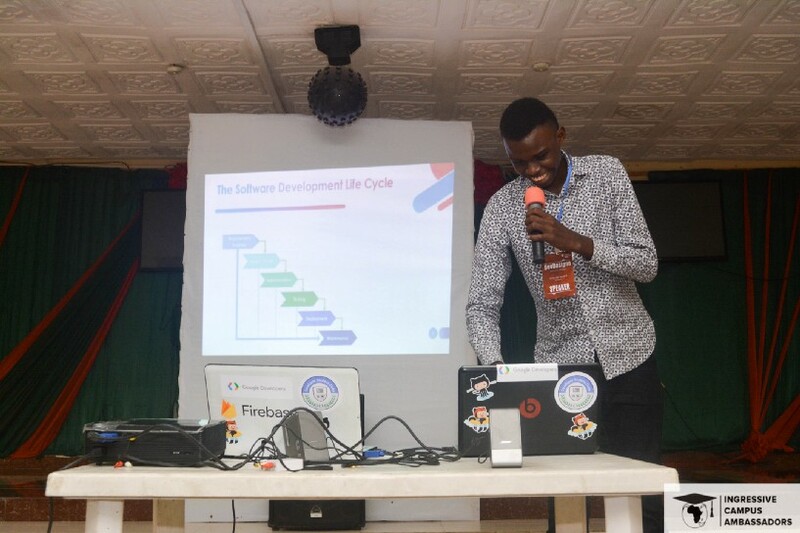 He spoke and on “Introduction to responsive web design”.Sam had a practical session were he showed the audience to make their web applications mobile friendly. We also networked among the students, shared refreshments and invited our Dsc Lead to give a closing remark. The event ended with a closing prayer and citation of the national anthem. and we all went out of the building to take group pictures. Special thanks to Ingressive, Our Keynote Speaker— Price Darlington, our four awesome speakers. The event won’t be a success without the support of the Ingressive Community Manager Abati Adewale, he helped ace up the event. Eto Olei , Dsc Lead Fuo. Group picture by the participants, Organizers and Speakers.